We want to follow this trend and therefore designed an infographic about acoustic guitars. It explains the different parts of an acoustic guitar in detail and describes the differences between classical and western guitars. I did not find a similar graphic on the web with all information and a clean design and thought it could be useful (especially for beginners). All information provided in the graphics should be considered as guidelines. There are always different acoustic guitar models that differ from those rules of thumb. As always, feedback and corrections are welcome. If you want to share this graphic on your website, please refer to duochords. 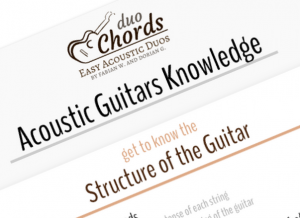 Never miss our latest chords and tablatures: Enter your email and receive notifications of new posts on duochords.